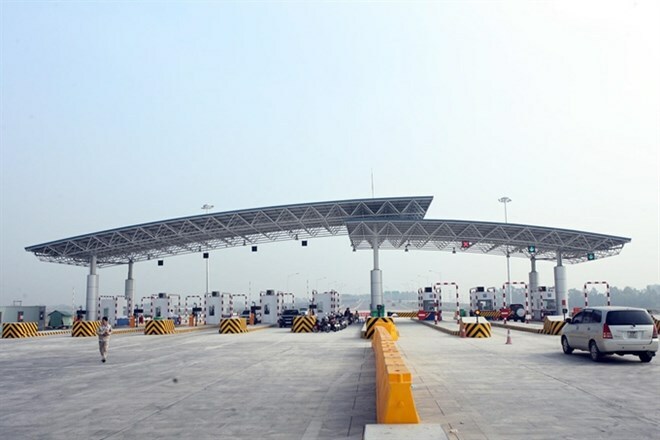 Hanoi (VNA) - Vehicles passing through the newly-built Hanoi-Hai Phong Expressway and the National Highway No5 will soon have to pay between 25 percent and 50 percent more as toll. The new fees will be applied from early next month, the Vietnam Infrastructure Development and Finance Investment JSC has said. Dao Van Chien, Chairman of the Managing Board of the company said that the increase was on the roadmap of the Ministry of Finance to serve the repair and maintenance of the National Highway No 5 and the fund payback of the Hanoi-Hai Phong Expressway. Currently, the Hanoi-Hai Phong Expressway collects 1,500 VND per kilometre (per km) per car. The increase will be 2,000 VND per km per car, equivalent to the HCM City-Long Thanh-Dau Giay Expressway. Replying to a question of the continuous increase of toll fees on the National Highway No 5, Chien said the route had been damaged on numerous occasions by overloaded vehicles. In 2014, the Ministry of Transport had invested 100 billion VND (4.5 million USD) for the repair work of the route, of which 60 billion VND (2.7 million USD) was paid by the company. This year, the repair work on the route was estimated to be 300 billion VND (13.5 million USD), and the Road Directorate had only allocated 20 billion VND (900,000 USD). Thus, the increase on fees was necessary, he said. To help ease financial difficulties for vehicles on the National Highway No 5, Chien said the investor would discount monthly tickets for the first time. This will be the last fee hike on the route, he said. Many transport companies said they were shocked by the new fees. Khuc Huu Thanh Hai, Director of the Dat Cang Transport Company, said the company operated 80 vehicles on the two routes. On average, it had to pay up to 800 million VND (36,000 USD) as toll fees each month. He said with the new rate, the company would suffer quite a large additional financial burden and would only make profit on weekends and holidays due to the small number of passengers travelling on the two routes. He said National Highway 5 had a policy of reducing the toll by 10 percent, if transport enterprises purchased monthly tickets, but the policy did not apply to the Hanoi-Hai Phong Expressway. The toll fee for this route was worth about eight passenger tickets, he said. Le Van Tien, Chairman of the Hai Phong Freight Transport Association, said the fee hike would cause more problems for transport enterprises. He said the transport businesses did not plan to increase the fares as fuel prices were stable. Bui Danh Lien, Chairman of the Hanoi Transport Association, said the BOT fee was inconsistent with the purchasing power of the people and might put financial pressure on the socio-economic life. The Hanoi-Hai Phong Expressway, the most modern of its kind in Vietnam, passes through Hanoi, Hung Yen, Hai Duong and Hai Phong with a total length of 105kms, a width of 33m with six lanes and an intended speed of 120km per hour. Invested by the Vietnam Infrastructure Development and Finance Investment JSC, the road is built at a total cost of nearly 45.5 trillion VND (2 billion USD) under the Built-Operate-Transfer (BOT) model.